Emily: Coming into the GTD XC program this summer, I knew of a number of fellow athletes from my area going off to college, along with me, who were doing the program, so I knew that I would be training alongside runners every day who would push me to the best of my ability. I definitely experienced this from the program, and felt lucky to have been able to run with people going through the same transition as me, that I could relate to. 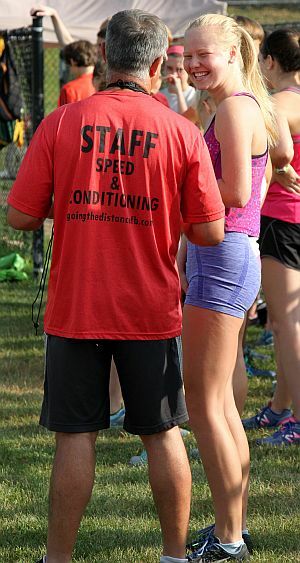 Emily:-My college coach told me that I needed to gradually build my mileage base this summer in preparation for my college program, and that was something Coach Braz definitely worked with me on this summer. Coach Braz created a great outline on an adjustable week to week basis for me, that provided me with a balance of speed and conditioning that simultaneously helped me build my mileage. Emily: The last phase of the training session was the hardest physically, but Coach Braz and the rest of the coaching staff prepared us each week for it, by gradually increasing our volume in different areas, so it didn't seem impossible or unreasonable for us to achieve. Strength is an element that I have always found the most difficult, but by the last session, I felt like I had a comfortable foundation going into school with. The program forced me to exit my comfort zone when it came to strength, and I really enjoyed how Coach Braz broke all of the conditioning up into stations, making the exercises of core, strength, and flexibility doable. Emily: The most important thing that I learned from the program was learning how to collaborate with others of different skill sets to become an all-round better athlete. I pushed myself with fellow athletes with some whose strength was doing weight exercises, as well as stayed with other runners who were used to doing more mileage than I had ever done before. This made training feel more effective, and I finished at the end of the summer feeling completely well-rounded as a runner in all ways that would benefit me. Emily: I am running both winter and spring track, and am very eager for the indoor season to begin. Emily: I am currently undecided in the school of communications, with a desired minor in creative writing. There are so many opportunities for communication studies that I am very excited about, being in Washington, D.C.